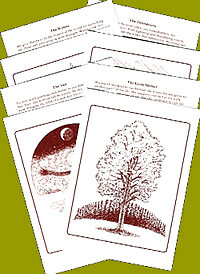 We are pleased to offer the Thanksgiving Address: Greetings to the Natural World in a pocket-size (4” x 5”) edition. These traditional Native American words of thanksgiving come from the people of the Six Nations — the Mohawk, Oneida, Onondaga, Cayuga, Seneca and Tuscarora — also known as the Iroquois or Haudenosaunee, who live in upstate New York, Wisconsin and Canada. 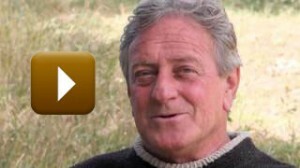 Spoken as a spiritual address to the powers of the natural world, these words are used to open gatherings in order to bring the minds of the people together as one and align the gathered minds with Nature. The roots of these words reach back thousands of years to the very origins of the Haudenosaunee as a people. We currently have ten different language editions: English, German, Swedish, Japanese, Portuguese, Spanish, Bisayan, French, Hawaiian, and Italian. Each language edition presents the original Mohawk text beneath the featured language, showing the roots of our inspiration. This publication was produced by The Tracking Project together with the Tree of Peace Society, the Six Nations Indian Museum and the Native Self-Sufficiency Center; proceeds are shared among these groups. 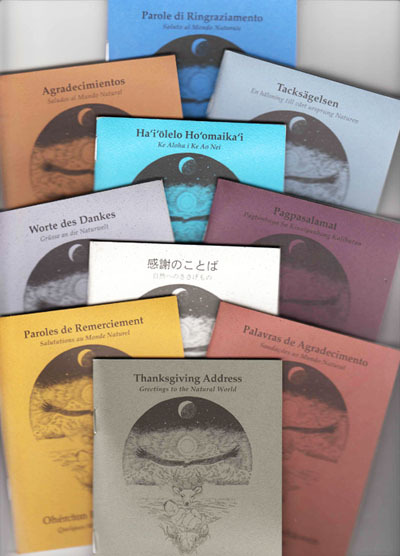 Each boxed set of our popular notecards contains eight different illustrations from the Thanksgiving Address. These 5” x 7” cards are blank on the inside with the accompanying words of thanks on the back, making them appropriate for every occasion. 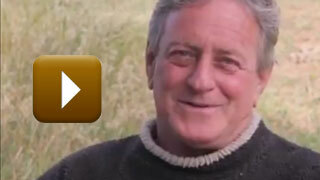 The Tracking project has taken thousands of people into the forests and deserts of four continents. This is the workout we rely on to keep our students and ourselves strong, flexible, and injury-free. 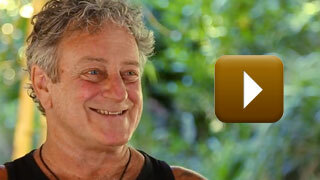 Whatever your fitness level, you will feel the power of this unique system, which draws on the traditions of Yoga, Taiji, Bagua, Qigong and much more, to develop a natural physique: lean and graceful, balanced and relaxed. Our 4” circular decal that goes everywhere you go — sturdy polyester with adhesive backing. Comes in White on Black, White on Turquoise, White on Teal, or Black on Rasta (red, yellow, green). Prepare yourself for hard ground tracking in the Southwest with our 23” x 30” desert tone posters! They feature the tracks of 34 different mammals and birds of the Southwest region. 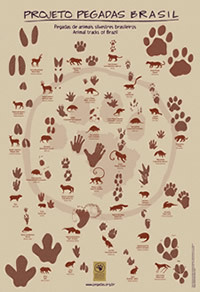 Drawn and designed specially for this poster by noted Mohawk artist, John Kahionhes Fadden, each track is presented in its average adult size as a visual guide to the relative size of each animal. 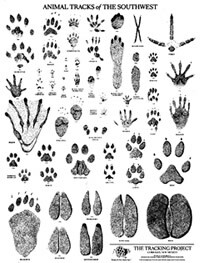 Tracks are grouped by family for ease of identification and comparison with related species. Great for home or classroom use. Our Brazilian partner, Projeto Pegadas Brasil, has produced a beautiful 25” x 37” poster featuring the tracks of 34 different Brazilian animals, including the capybara, tapir, howler monkey, giant otter, kinkajou, and jaguar. This large poster in sand and earth tones presents a silhouette of each animal together with a front and rear track. Names of the animals are given in English, Portuguese, and the scientific Latin name. Purchase this great companion to our popular Southwest tracks poster and prepare yourself for tracking in South America!